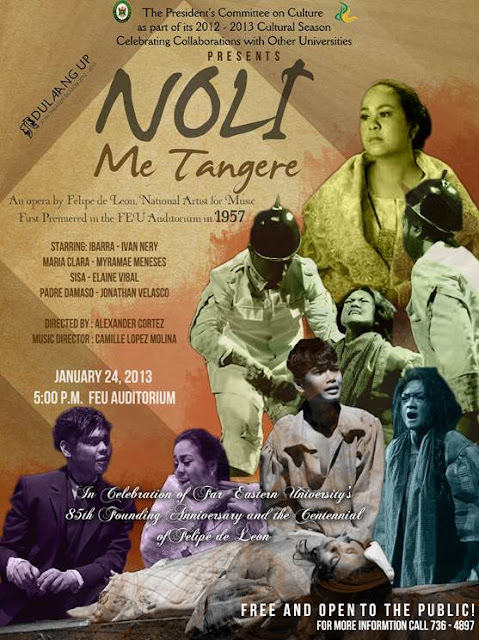 As part of Far Eastern University’s (FEU) 85th anniversary celebrations, its President’s Committee on Culture is proud to present a one-night only performance of Noli Me Tangere, an opera by Felipe de Leon, National Artist for Music whose birth centennial is also being celebrated this year. This will be held on January 24, 2013 at 5pm at the FEU Auditorium. The production is a concert version of the opera featuring the cast from Dulaang UP's own successful staging of this work, marks its return to FEU after it premiered in the historic FEU Auditorium in 1957. Directed by Alexander Cortez with musical direction by Camille Lopez Molina, it features some of the country’s brightest operatic talents including Ivan Nerry as Ibarra, Myramae Meneses as Maria Clara, Elaine Vibal as Sisa and Jonathan Velasco as Padre Damaso. For information or to reserve seats for this free performance, please call FEU's President's Committee on Culture at (632) 736 4897 or send a message via its Facebook page: www.facebook.com/FEUPCC.